The Best of Teacher Entrepreneurs II: FREE MATH LESSON - “Multplication & Division - Math Operations & Algebraic Thinking"
FREE MATH LESSON - “Multplication & Division - Math Operations & Algebraic Thinking"
Happy Valentine's Day from TGIF - Third Grade is Fun! Thank you teachers for giving your heart to your students and profession every day. It is truly an act of love. In honor of what you do everyday, I have created the following freebie as my way of saying thank you. We all want to keep our students' minds fresh on all of their facts (multiplication & division) while we move on to other topics such as fractions and geometry. To keep it fun and fresh for my class, I created these Valentine's Day activities that are correlated to the CCSS (3.OA.B.6, 3.OA.C.7). Related Facts and Divide & Conquer Freebies! Click this link to snag these freebies and please leave some feedback. These make a wonderful hallway display. What an easy way to brighten up the hallway and show everyone who visits what your class has worked so hard on. This freebie is part of a larger pack that has activities for ALL of the Operations & Algebraic Thinking standards. 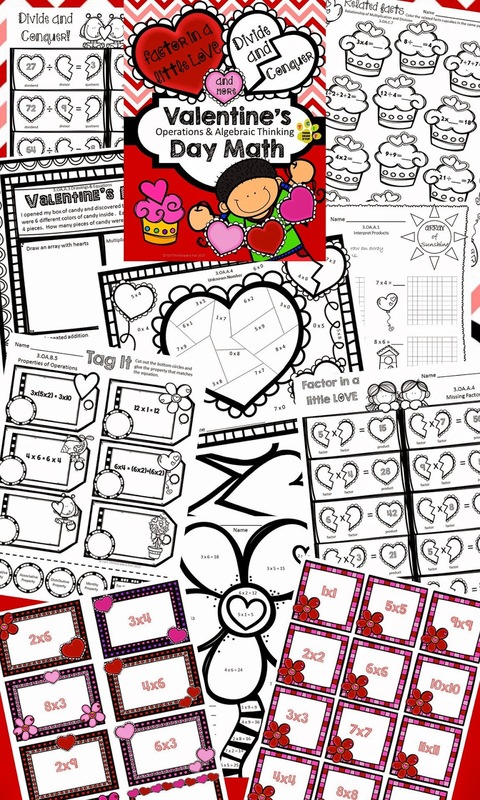 If you are interested in taking a sneak peak at it, click on this link: Valentines Day Multiplication and Division Pack. Here is a preview of some of the pages in the pack. Follow me on Facebook for teaching tips, freebies giveaways, and ways to organize your classroom.